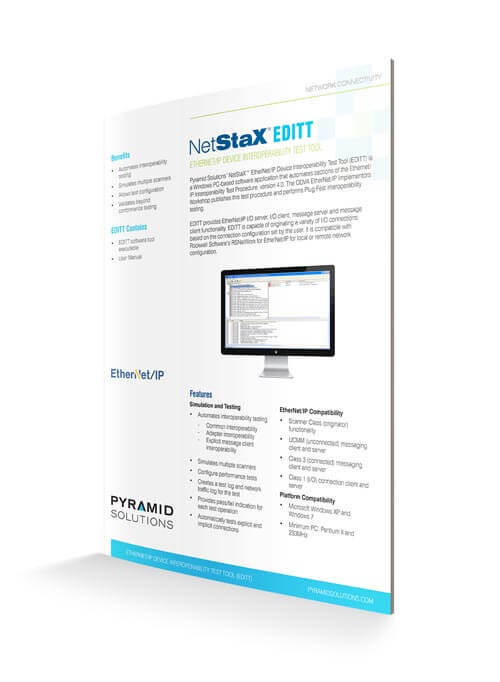 Our NetStaX™ EtherNet/IP™ Device Interoperability Test Tool (EDITT) is a PC/Windows based software application that automates sections of the EtherNet/IP interoperability PlugFest Test Procedure. The ODVA EtherNet/IP Implementors Workshop publishes this test procedure and performs it during PlugFest interoperability testing events. EDITT provides EtherNet/IP I/O Server, I/O Client, Message Server and Message Client functionality. EDITT is capable of originating a variety of I/O connections based on the connection configuration set by the user. EDITT is compatible with Rockwell Software RSNetWorx for EtherNet/IP or local or remote network configurations.